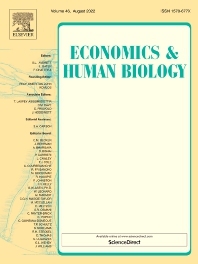 Economics and Human Biology is devoted to the exploration of the effect of socio-economic processes on human beings as biological organisms. Research covered in this (quarterly) interdisciplinary journal is not bound by temporal or geographic limitations. The impact of socio-economic processes, such as industrialization, urbanization, agricultural policy, technological change and commercialization and the degree of penetration of the world food system on biological welfare and health outcomes. The effects of government intervention programs, as well as macroeconomic and public health policy on the human organism at either the individual or the population level. Feedback effects from human biological outcomes to economic growth at the national, regional and local levels insofar as healthier individuals invariably lead longer more creative and more productive lives, influencing thereby the course of economic development. The complex symbiotic relationship between such anthropometric indicators as weight, birth-weight, physical stature and the body-mass-index, as well as morbidity and mortality, on the one hand and socio-economic processes or events on the other. The conceptualization of health and health models in economic theory. The measurement of poverty, malnutrition and psychological deprivation and the role of health and income inequality in the persistence of poverty traps. The biological components of the quality of life: how well does the human organism itself thrive in its socio-economic and epidemiological environment. Health and economic systems; environment and health; health in the transition economies. Statistical, econometric, methodological and philosophical issues associated with the measurement and modeling of these relationships. Contributions in auxology, anthropometry, biocultural anthropology, demography, development economics, economic history, epidemiology, health economics, human biology, human nutrition, health sciences, medicine, physical anthropology, public health and sociology are welcomed.